As we prepare our youth to return to school, it’s also a good time to think about our own growth in the most important area of our lives – our relationship with God. 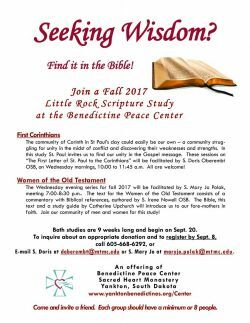 The Benedictine Peace Center is hosting two Scripture Study groups, using the Little Rock Scripture Study created by the Catholic Diocese of Little Rock in Arkansas. The morning series, The First Letter of Paul to the Corinthians, will be facilitated by Sr. Doris Oberembt, meeting Wednesday mornings at 10:00-11:45 a.m. for 9 weeks beginning September 20. Women of the Old Testament, facilitated by Sr. Mary Jo Polak, will meet 7:00-8:30 on Wednesday evenings, also beginning on September 20 for 9 weeks. For more information on the study, costs, and registration, go to yanktonbenedictines.org/center/ and then click on the Scripture Study page, or call 605-668-6292. The registration deadline is September 8 to allow time to order materials.